Who needs Olympics or a Jubilee to have a great day out in 2012? On the 27th of April we took our favourite Birmingham City Transport bus 2976 around the Outer Circle. We were full to capacity and even had to raffle off two of the front seats upstairs – thanks to Steve for dipping his hand in his pocket to pull out a crisp tenner for the privilege. The weather was, to say the least a bit WET! But that did not prevent us all having a good tour round the Second City’s famous no 11 bus route. The bus was crewed by driver Mike who fought manfully with the sixty year old engine & gearbox to get our very full bus up some of the Outer Circle’s hills, especially in Reservoir Road in Erdington! Mike was joined by Wythall Museum Trustee Malcolm Keeley who acted as conductor. Before we set off Malcolm enlisted the help of Lillian, originally from Essex, who had a lifelong ambition to be a “clippie” (although she tells us that she ended up working at Ford’s). Lillian did a sterling job “selling” tickets and raised over £25.00 towards our charities. With the rain showing no sign of abating, we collected our remaining passengers from Sarehole Mill and armed with cloths to wipe the steamed up windows started our tour. As usual we got waves from those that spotted us especially the drivers on the 11C, probably out of surprise as we trundled towards them! We got to Tesco at Witton at about 11:30 where we were, as usual, given a warm & efficient welcome by Jim and his staff in the supermarket café. 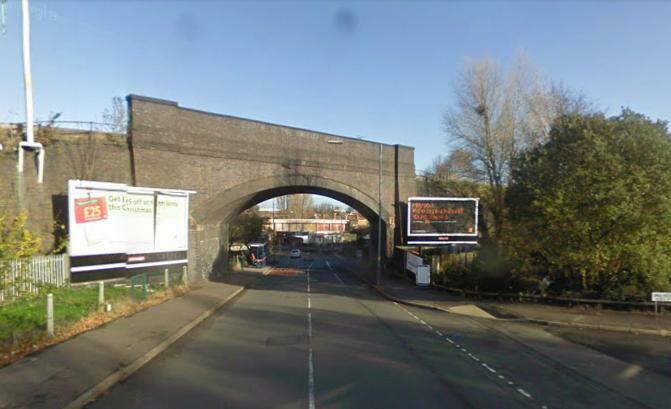 The tour ended without further grammatical misdemeanours and we collected a generous bucket of change as our passengers disembarked, giving us a total of £80.00 to split between St Mary’s Hospice in Selly Oak and The Wythall Transport Museum. 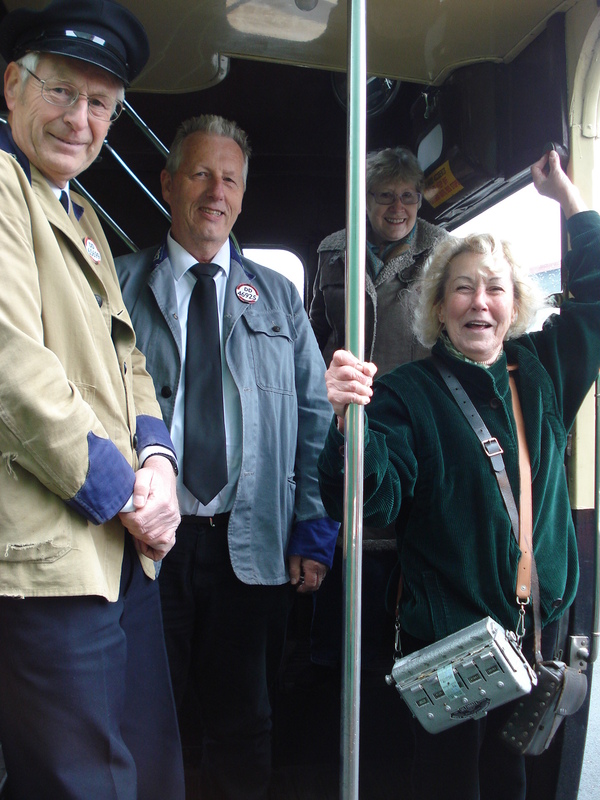 Thanks to all our passengers and the museum staff who made our journey in a splendidly turned out bus so enjoyable. On the 19th of June we are off for a different tour. This time we are taking a single deck Midland Red bus from Wythall to Cheltenham Racecourse where we will join a steam train on the Gloucestershire & Warwickshire Railway for a 25 minute ride to Winchcombe. Then we will get back on the bus to go to Stanway House Gardens near Toddington so that we can see the tallest fountain on Britain in action. Finally we will go to Broadway for an hour to mooch round the shops or get a cuppa. The tour will highlight some of the interesting facts about our route including some of the very gory events that have transpired since the eighth century in these rural backwaters of Worcestershire & Gloucestershire. To reserve seats on this tour go to our CONTACT US page & get in touch. Tickets are just £29.00 each including the train fare and entry to Stanway House Gardens. In September we have a further Outer Circle Tour on the 21st, but that is now full but we now have an additional Outer Circle outing on the 28th. If you or any one that you know wants to book for this please get in touch HERE. Tickets are £16.00 each. We’ve had a few photos from our passengers – take a look below and at our gallery HERE. 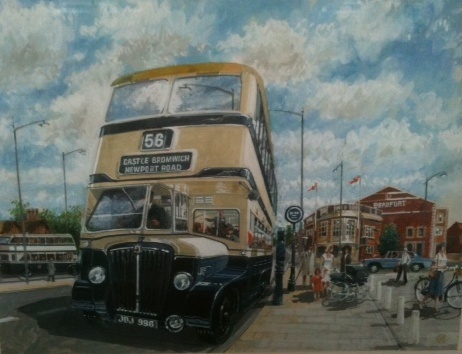 Finally thank you to Ian who sent me the photograph shown below that he took of a painting showing a Birmingham bus similar to ours outside the Beaufort Cinema in Stechford in the 1950s. We look forward to meeting you later this year. This entry was posted in Cotswold Bus Trips, Outer Circle Bus Trips, Stanway Fountain, Steam Railway, Vintage Bus trips in 2012 and tagged 1950s Birmingham Corporation Double-Decker, Birmingham, Birmingham City Transport, Bus Tour, Buy tickets, Charity, Cotswold Bus Trip, Guided Tour, Historic Bus Tour, Outer Circle Bus, Ride the Outer Circle, St Mary's Hospice, Stanway Fountain, Steam Train, Vintage Bus, Vintage Bus Trip, Wythall Transport Museum. Bookmark the permalink.